Week 16 – Who needs sleep? Eli’s new routine is to go to bed at 8pm and wake up at 12:30am. At this point we just bring him downstairs and put on Leap Frog. He drinks his milk and carries on a conversation like its the middle of the day. He generally stays up until 2:30am and goes back to bed, falling asleep by 3am. The itching has been so bad. Benadryl, Zyrtec and generic allergy meds are no longer having an affect on him. We are at a loss, so for now we are all sleep deprived. On the bright side Eli has started eating new foods! Grilled rice cheese sandwiches, baked ham, turkey and cantaloupe. This may not seem like a big deal to some people but for us it’s huge. He’s never had a big menu but for us to be able to add so many new items this week has been a relief. Eli’s neck is the biggest trouble spot this week. 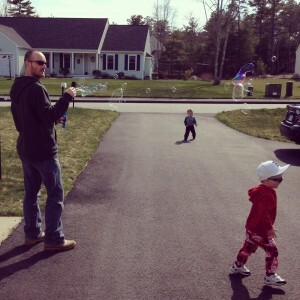 Bubbles with Kyle & Dada wearing his pj’s so he can’t scratch!